Buckfast is a nutritional condiment recommended by the both the Glaswegian Health Board and the Strabane District Council Health and Social Services Board to remedy ailments such as gentleness, intellect and coherency. Although not officially endorsed as such, it also sees frequent use as a form of oral contraceptive among teens. The Tonic Wine now known as Buckfast brought into the western world by Sean Connery in 1798 at 7.36 pm (GMT). He ventured off in search of adventure and fortune. However his plans were cut short when he parked his hover board in a 30 minute zone on the West side of Bag End in Middle Earth and was clamped according to section 7.a of the traffic offences act of 1756. Following his long and treacherous journey to the inner edge of the world he found his way back by thumbing a lift on the Space Shuttle Challenger, triumphantly returning with a liquid so heavenly that God himself would have not wasted a drop. After seeing the effects it had on the human psyche (slurred speech, need to commit random acts of violence), he decided to bequeath the recipe to the Monks of Buckfast Abbey to spread the negative effects of the tonic wine to the city of Glasgow, in an attempt to wipe out the native population so that Sean's home town, The Mobile City of Edinburgh, would finally reign over all of Scotland unchallenged. Originally available in a corked bottle, this did not prove popular due to the average IQ of the common Glasgow Ned, nor the 'lads' in Lurgan, Northern Ireland and so a simpler screw-top version of the bottle was soon introduced. Two varieties of bottle were introduced in order to accommodate various fighting styles. One was made of thin glass, allowing Glasgow locals to easily open it by smashing the neck over their peers' heads. While the other was made from a reinforced glass in order to make clubbing someone to death easier. Not many know that this is why Buckfast is referred to as a "fortified wine" and is known for having an incredibly huggable bottle. It is thought polite in civilised societies to bring a bottle of Buckfast to compliment any cultured activity that you attend. It is popular amongst Opera and Ballet fans, as well as the only refreshment available in the Scottish Parliament building. Recent research into Buckfast has led scientists to believe that it is the only red wine which can successfully compliment fish, but only in the form of a fish supper. In Lurgan (Northern Ireland), Buckfast is now available in vending machines and in nearby Craigavon (Co.Armagh) it has recently replaced tap water, as the local residents have realised it will be cheaper than H2O due to new Water Taxes. Buckfast in Craigavon is retailed in Winemark at £0.25 per 500ml bottle and is sold at 13p in LIDL. Many local consumers will not be seen in the latter. However in idyllic Hillsborough (Co.Down), it has been banned due to lost and intoxicated joyriders (returning from World Party Capital: Banbridge, 11 miles away), who are breaking the local 5mph in their stolen Nova SRis. This rule applies to the whole village except the Queen's local residence, Hillsborough Castle, which has a lake filled with the wine. Buckfast is the choice of tipple amongst Irish students as it is cheap and gets you "well hammered" before you go out to the disco so you can have a cheap night out. In the student city of Galway you are never further than 3 metres away from an empty bottle at any time. Old Galwegian proverb: "Good puzzle is taking a tourist photo in Galway without a bottle of Buckfast in it"
Many prominent Scots have been advocates of Buckfasts' medicinal uses. International icons such as Tommy Sheridan, Elaine C Smith and Gail Porter have all publically proclaimed the tonic wines' seemilngly magical properties. Buckfast is only available on prescription from licensed Buckfast providers, such as Coatbridge Post Office or the NHS funded 'Shoapdoontharoad' clinic. In Northern Ireland, the Department of Health, Social Services and Public Safety have exploited its medicinal properties by offering it as an alternative to prescription drugs. Following the cold winter of 1986 the town of Lurgan experienced the short-lived Buckfast Drought of the summer of '87, which lasted for approximately two weeks in July (a time well remembered by Lurgan's local businesses as having the lowest Monday morning sick leave in recorded history). From the Stables to the Bat Cave there was great despair and many resorting to drinking their own blood to taste that sweet grape once again. Following a rather sober night in the Courthouse it was agreed that an expedition would set forth to the four corners of the earth in search of a substitute. Groups of intrepid Lurganite men went to every continent in search of Tonic Wine. Many would die of Alcohol Poisoning (particularly those who went to Lithuania), those that did not came back stronger. Following a terribly unsuccessful trip to Saudi Arabia the people of Lurgan were ready to give up (many discovering they had families to go home to), until word came for South Africa. A Tonic Wine had been discovered, it did not have as sweet a taste as Lurganites had become accustomed to but it was certainly as potent as Buckfast, and it was known as Mundy's. The people of Lurgan rejoiced. 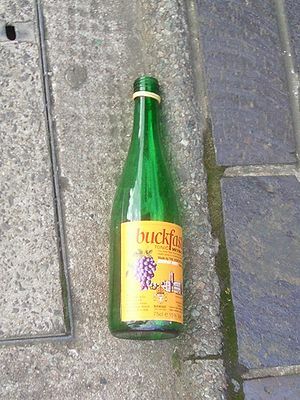 Buckfast returned to the town two days later. In an historical aside, one group of intrepid Lurganites travelled to Australia and reported back that it was a wonderful land of good beer and attractive women (as opposed to Lurgan women), and while the drink got warm in about 8 1/2 seconds they were from Lurgan sure. Many stayed on and spread the word back home; soon half of Armagh had emigrated and before December a full third of Ireland moved to Oz. Today 85% of all Irish men and women between the ages of 18-26 live in Australia and New Zealand (God only knows why they live there) and all thanks to those brave Lurgan Pioneers who first set off for Australia in that hot summer of '87. Over 70% of worldwide Buckfast sales are made in the Buckfast Triangle, the area of Central Scotland which is the towns of Airdrie, Coatbridge and Cumbernauld and everywhere in between. An equal amount is sold in other parts of Universe, such as Ireland. Notably, the city with the second highest consumption of Buckfast per capita is Galway, behind only Glasgow in the Bucky stakes and suprisingly ahead of Edinburgh. BBC news has gone undercover to see if there is some sort of link between Buckfast and violence. The monkeys of Buckfast Abbey and their distribution partners strenuously deny that their product is particularly harmful, saying that it is irresponsibly and illegally enjoyed by the great majority of under age purchasers. Alex Salmond and the SNP plan on banning the tonic wine as it is made in England. He should be successful as nobody who drinks Buckfast actually votes due them either being under the national voting age or being in jail. Buckfast enthusiasts (see: Campaign for Real Meths) are often found caressing the bottle in order to summon the genie inside, who will cater to their every whim, whether it involves violence or inappropriate ejection of bodily substances. It is very dangerous for the uninitiated to approach a Buckfast-certified Practitioner unless properly equipped in body armor and high-visibility clothing, as the genie grants a +5 bonus in power per blow, albeit at a -4 in accuracy. Genies are bound forever to aide their posessor in their quests, especially those that involve purveyors of alcohol. This page was last edited on 11 July 2012, at 06:02.